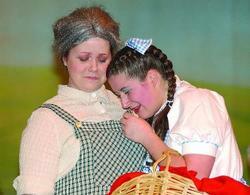 Follow the yellow brick road — to Fostoria High School. Students will perform "The Wizard of Oz" Friday at 7:30 p.m. and Sunday at 3 p.m. at the Performing Arts Center of Fostoria High School, 1001 Park Ave. Tickets are $8 for all seats. Call 419-701-2690 to reserve tickets. The show is directed by school choir director Betsy Bellavia. French teacher Laurie Martishius is the assistant director. The cast includes about 50 singers and dancers, plus more students working behind the scenes. The performance stars Burgandy Beam in the leading role of Dorothy. Other cast members include Charlie Hinton as the Scarecrow, Josh Spivey as the Tin Man, Sam Zeigler as the Cowardly Lion, Aubrey Rickle as the Wicked Witch of the West, Gabby Rickle as Glinda, Kenny Noble as Uncle Henry and the Guard of Emerald City and DJ Johnson as the Wizard of Oz. Joe Sheak, FHS band director, is directing the orchestra made up of volunteers and FHS students. Teacher Michael Daring constructed the sets, and student Aaron Clark designed the painting of the sets with help from other students who did the painting. The lighting will be of professional quality. Bellavia has brought in Tim Guth of Tim Beck-Two Productions, who she's worked with in the past. She said he brings a professional look to the show and brought in "a truckload" of lights and sound equipment for "The Wizard of Oz." Guth has a crew of students working alongside him on lighting. He hopes the experience is educational for them. "They're finding out that it's hard work," he said.